Born in Portugal, Chancellor showed a strong talent for drawing as a child and won various awards. Struck with a burning desire to work on boats he ran away to sea when he was 14 but after several days ‘awol’, was persuaded to return home. When war broke out he joined the merchant navy as an apprentice officer, aged 16. He then spent thirty years at sea working on all kinds of vessels all around the world. 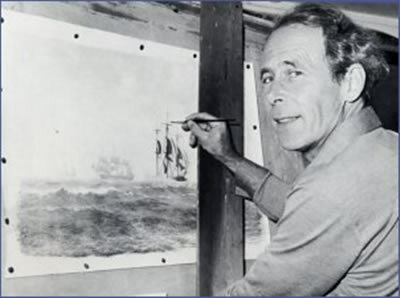 Chancellor had great artistic ability but he also brought an intimate knowledge of the sea and sailing ships to his paintings. As well as the fighting vessels of Nelson’s age he took great delight in bringing to life the trading and fishing vessels under sail of more recent times. His paintings took hundreds of hours to produce, such was his devotion to research and maritime accuracy. He knew every aspect of the sea and weather conditions – the colour of the sky at any particular time of day and its reflection on the surface of the water; the size of a swell; the type of cloud cover etc. I have a print of his magnificent Victory in Pursuit of Nelson hanging over the fireplace in my living room. It just seems so right there, and I must admit I have to stand with legs firmly apart when I look at it, so realistic is the feeling that I’m back at sea! You can look at this painting as a splendid rendition of a proud ship at sea, or you can see it as Chancellor’s frozen moment in time – 25 May, 1803, 3pm. The wind is W by S, 4‑5; she’s steering S by W, making 6‑7 knots. There’s a swell from W by N due to the previous days being dominated by N to NW winds. One of the compelling aspects about Chancellor’s paintings is the meticulous attention to detail. Come up very close to Victory in Pursuit of Nelson and you’ll even see a man using the heads! And the tracery of rigging has exactly the right sort of tension curve to be expected at that precise point of the roll. Among the limited edition prints in the upcoming Retrospective will be A Perfect Hurricane, painted in 1974 – and one of my favourites. The painting tells a story. 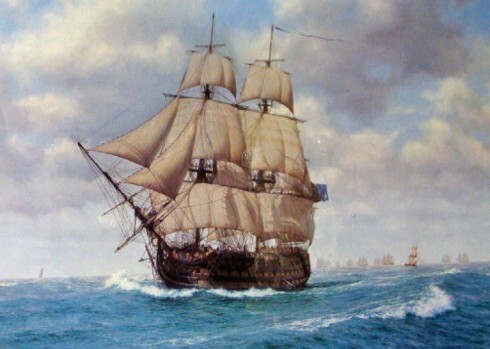 The 20-gun La Prompte, on passage to Bermuda for stores, captured a French schooner, Courier du Cap and after taking all her people prisoner and putting a prize crew aboard, both vessels continued towards Bermuda. Two days later, the wind began to freshen and by midnight was blowing a full gale. 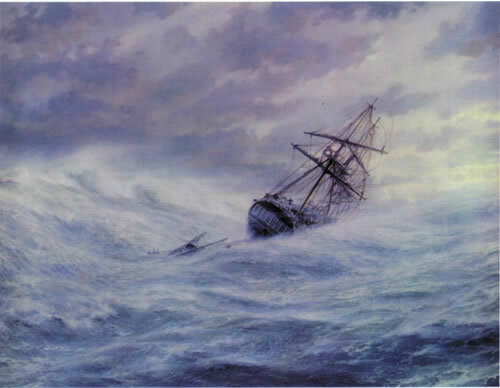 The following morning conditions had worsened and La Prompte sent down her fore and main topgallant yards and masts. The prize ship hoisted a distress signal; she had sprung a leak. A severe gale was now from the ESE and with a heavy sea running there was little hope of taking the men off her. The weather continued to deteriorate into the morning and later that day the prize ship went down with all hands. Despite the conditions, La Prompte remained in the area, but she was powerless to get to windward to search for any survivors. At 5pm a hurricane struck. The storm mizzen staysail blew to pieces and although her rig was snugged down, with no topgallant masts or yards aloft and not a stick of canvas set, she was held down practically on her beam ends by the sheer weight of wind in her rigging. Her situation was desperate; she was making water and would soon capsize. The helm was put hard up and an attempt was made to set the storm fore-staysail to get her before the wind, but it blew to shreds. The fore-yards were then trimmed and the foresail loosed, but it burst into a thousand ribbons and the ship still lay beam on, hove down by the wind. In a last-ditch and daring piece of seamanship her captain ordered the mizzenmast to be felled. This reduced the windage aft, and as the ship drifted to leeward of the wreckage, the remaining cordage still attached helped to tug her stern to windward like a sea anchor. This is the moment of the painting. Another print in the exhibition that I am drawn to is Day of the Men. The way Chancellor has captured the light gives the work an almost ethereal quality. It’s mid morning and a gentle north-westerly breeze is blowing. The Grand Bank barquentines are getting underway from St Malo for the fishing grounds off Canada. As they get underway many local small craft sail out to bid them farewell. Ahead of them is the long voyage across the Atlantic and many months of arduous and hazardous fishing for cod in the little dories stacked on deck. Chancellor drew on his childhood memories for this painting. 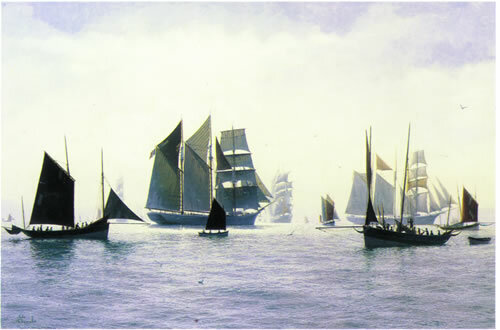 As a very young boy living on the north bank of the Tagus, he witnessed the spectacle of a huge fleet of schooners and square riggers setting sail to fish the Grand Banks. As well as limited edition prints, paintings and drawings, the exhibition will have on show memorabilia relating to personal aspects of John Chancellor’s life. The venue: Brixham Town Hall, Bolton Cross, Brixham, Devon TQ5 8TA. Saturday 19 to Monday 21. Opening hours – 10 am to 8 pm Saturday and Sunday, 10 am to 4 pm on Monday. Entry is free. Two books have been published on Chancellor’s works. Now out of print, they can often be sourced via the internet however. I have only just come across this by accident! I am Tessa, John Chancellor’s daughter and I am so delighted to hear all your comments. It was great to finally meet Julian and Kathy after many years of corresponding. Thanks Steve Counsell for all the help you and your wife Pat gave at the Exhibition. It was a huge success and I can echo all the comments you made. Everyone wanted a part of it – as if Brixham was one big John Chancellor family! The exhibition took months to prepare but was worth every minute – it was so wonderful to hear the comments about John’s work and to speak to so many people who still remember him personally. I was one very proud daughter! Writing the new, accompanying John Chancellor, His Life and Work brochure (graphics by my son John), was a wonderful way for me to reflect on his life – not only as a seaman and an artist, but as the wonderful family man I remember most. I chose to limit the production of the brochure to only 500 copies to make them more special but in keeping with John’s desire to make his work available to a wide audience, we kept the price to an affordable £8. They were hugely popular but there are some left if you missed out! Oh, por Dios! Srta Tessa, Estoy tocada profundamente por la obra de vuestro padre. Yo estoy investigando sobre la familia Chancellor, porque estoy casada con uno de ellos y tengo un pequeño hijo llamado Alejandro Chancellor. Estoy trabajando en el árbol genealógico de mi hijo, mi esposo, mi suegro y así di con la pintura de su padre, me he conmovido porque lleva a uno a sentir que está en el barco, que es real y que uno forma parte de la pintura. La obra de vuestro padre, transporta al simple observador en parte de lo observado y desata las emociones de estar allí. Ahora le comento, mi suegro (James Block Chancellor) vino con sus padres a Venezuela desde Inglaterra en 1931. Se llamaban John Bird CHANCELLOR (Hijo de John Brando Chancellor y Ellen Faber Bird) y Constance Helen Block (Hija de Sir Adam Samuel JamesBlock). Fue su padre de esta rama familiar? Mucho agradezco su respuesta, pues estamos completando el árbol genealógico familiar. Me encantaría promover una exposición de su padre acá en Venezuela. Thank you for your correspondence: I do hope my response in English reflects your email correctly? How interesting that you are doing your Chancellor family tree. My father, the late John Chancellor, did spend some time in Venezuela following the War years (c. 1946/47) but I am sorry to say that to the best of my knowledge, our Chancellor family has no connection to yours. John loved the life in Venezuela and painted some wonderful pictures whilst there, many if which he brought back to England with him and later sold. Unlike most of his maritime paintings, there is one picture lovely picture (seen for the first time in public at the exhibition, and featured in the ‘John Chancellor: His Life and Work’ brochure), called ‘Laguna Maracaibo Venezuela, 1947’, featuring a West Indian in a dug out canoe in a lovely setting of trees on a river. It was a personal favourite of John’s, and was therefore not sold and remains in the family . Good luck with your family tree. it makes me very happy to see that you are alve and well. i am finally reading caribbee, and am proud that i have read all your books. please write to me at nicholasschlee3@gmail.com and tell me that you are still writing, and what you are writing. Certainly still writing, Nicholas! The next book out is PASHA, in October. I have just come back from helping at the Chancellor Exhibition. I was overwhelmed with all sorts of things; the obvious delight of the people who came to the exhibition – lots of them knew the family/already owned prints; the number of people who came (over 700 in 3 days); the amount of sales made; the number of people who came in clutching a John Chancellor under their arm that the family had never seen! ; the sense that everyone wanted to tell you their life history and their connection with the Chancellor family; the number of people who traveled large distances just to come; the cries of astonishment and joy and awe and superlative comments traded around the room; echoes of “no-one can paint seas like John Chancellor” or “look at the detail, just look at the detail” or “will you be putting this exhibition on every year” (at which point Tessa, the organiser, had to go and lie down in a darkened room whilst her husband threatened divorce papers!!!) or “ you really should put this on at the National Maritime Museum (Portsmouth Historic Dockyard, Plymouth) you know” (another darkened room looming!!). My only disappointment was that I missed Julian and Kathy’s visit on Saturday. Thank you though for thinking of me and the post card. Perhaps we shall meet on another occasion. Great to hear it all went off so well! Kathy and I certainly enjoyed our visit and were sorry to miss meeting you. Thank you Julian; we visited the exhibition this afternoon (Saturday). He was a remarkable talent.Wish we could get an original : but we got an £8 catalogue! Kathy and I visited this morning! They almost jump out at you and you can almost smell the salt air and feel the spray. At least one Kydd reader and Chancellor fan will be helping at the Exhibition on the Sunday and Monday. Look out for “Steve”, a friend of John’s daughter Tessa not her husband Stephen, and we can talk about the merits of both artist and author!